While a DIY home inspection is not a suitable replacement for a professional inspection, it can be a helpful tool. This way, you can feel more confident in deciding whether your home is ready to be put on the market or if you should move forward with purchasing a particular property yourself. 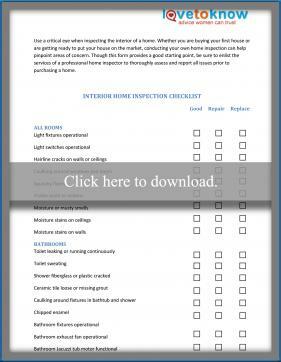 Arm yourself with comprehensive home inspection documents like these printable checklists for the interior and exterior of the home. Simply click the images below to download, save and print. If you need help with downloading the checklists, refer to these helpful tips. 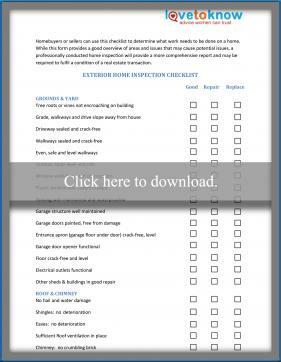 Using these forms will guide you through the items you need to inspect and provide a much more organized framework than simply walking through the house and glancing at everything. By following a pre-written inspection checklist, you will be able to stay on task and concentrate on the items that deserve your attention the most. Record your findings! Do not trust your memory to record everything that you notice during your self-inspection. You should choose a day to inspect the house when you will have full access to every part of the home, including the exterior. Do not choose a day when your efforts will be hampered by rain, or if you are inspecting the home you want to purchase, select a day when the current homeowners are willing to grant you full access to both the interior and exterior of the home. Be thorough when evaluating the exterior of the home. Look at the walkways, driveways, patios and decks. Check for cracks, broken or uneven surfaces. Look at the roof. Is the ridge of the roof straight and level or does the roof sag? Are there any damaged or missing shingles? Is there any loose flashing at the chimney or where the various elevations of the roof meet? Look at the chimney. Is the cap cracked? Is there a fire prevention cap on the chimney? Is the chimney straight? Are any bricks or mortar missing? Inspect the gutters and downspouts. Be sure the gutter slopes down toward the downspouts. Look for any loose sections or any rust or peeling paint. Examine the wall coverings. 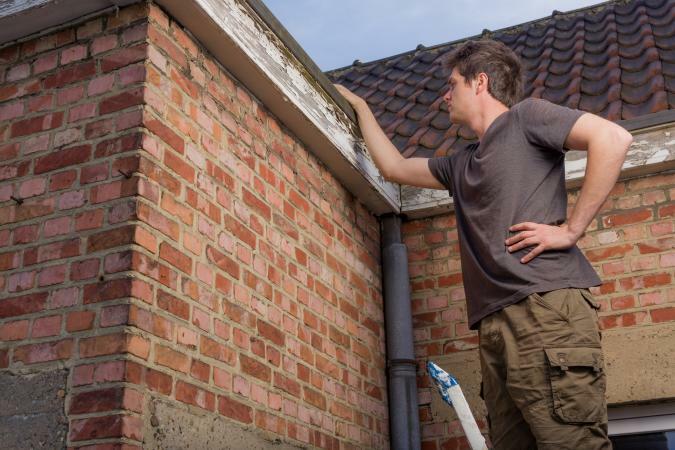 Look for missing or cracked bricks, boards and siding. Notice any obvious gaps or any visible rot. Look at the painted walls. Look for any problems with the paint or caulking. Inspect the foundation. Note any water marks, cracking or flaking. Move closer and look at the porch, scanning down from the top to the foundation. Look for flaking or cracking masonry. Take note of any paint problems or obvious settlement or structural problems. First impressions can be deceiving, so be sure to inspect the details of the home's interior carefully. Inspect the entire floor. Look for sagging or sloping. Note any water stains, cracked tiles, damaged wood or worn carpet. Inspect the entire section of each wall. Look for cracks, irregularities and water stains. Look at each electrical outlet and light switch. Be sure to look in every closet and open every door and window. Look for the heat source of each room. Inspect the entire ceiling. Look for stains, cracks and loose or sagging plaster. Open and close windows and doors, including closet doors. Look for smooth operation of the window, doors and locks. Complete the inspection by inspecting items in the room such as appliances. If there is a basement, look for water and mildew stains on the floors, walls and ceilings. Look for obvious issues in the floor joists. In the bathroom and kitchen, inspect the floor, walls and ceiling. Look at each plumbing fixture, checking that they work. Turn on the faucets to see if they leak and if there is enough water pressure. Look under the countertop for water stains or wood rot. Open and close drawers and cabinet doors to be sure they work smoothly. In the living room, inspect the inside and outside of the fireplace. Ask about the age of the furnace, air conditioner and hot water heater. Check how frequently they are serviced. Check any visible water supply pipes for rust or corrosion. As you work through the checklist, take photos with a camera so you can later reference any issues that need to be repaired by referring to an actual photo. A digital camera will work best because you can immediately review the photo to make sure the image conveys the damage that needs to be repaired. Combine the inspection you conduct yourself with the inspection of a licensed professional to ensure you have all the information you need in order to make an informed decision. While a professional inspection is a must, there is no reason why you should not also conduct your own inspection using a pre-written checklist.